Would you like to take a walk in the woods? Jeju has quite a variety of forest walks on offer. From 'gotjawal' to 'recreational forest', there's sure to be something to please every taste and mood. 'Gotjawal' is a Jeju dialect word translating loosely as 'rocky forest', perhaps more accurately as 'dense volcanic woodland'. Unique in its terrain, trees seem to grow from rock and in all manner of shapes as they cope with the challenging topography. Jeju gotjawal (for which there is no truly adequate English word) provides an atmosphere of mystery and magic. Vents in its volcanic floor result in a microclimate distinct from that of the remainder of the island. Plants both temperate and tropical grow in this unusual atmosphere, with its natural stone water basins as well as water puri-fication, mineralization, and recharging provided by the combination of porous basalt over deep aquifers. 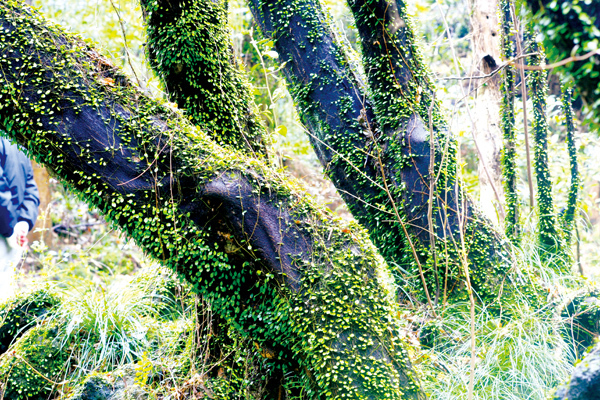 These gotjawal, often referred to as the 'lungs' of Jeju akin to the Brazilian rainforest, have also traditionally fed Jeju people by providing both edible and medicinal botanicals as well as birds and small mammals for trapping. They have been a source of wood for building material and for making charcoal, traditional kilns for which may still be found here. And in some areas where a large, flat, hardened lava bed can be found, livestock was corralled and humans encamped. Even prehistoric sites including human artifacts have been found in these woods. For Jeju people, 'gotjawal' is synonymous with 'life'. Today, as a result of development, vast areas have been lost; several trusts and preservation groups have been formed in order to protect what remains. And thanks in large part to the Jeju Olle trail system, trekking through gotjawal is easier today than ever before. Be aware, however: gotjawal is natural forest rife with living organisms, and trekking should be done with care; the trails themselves are natural as well, including jutting stones, tree roots, and more. It is recommended that walkers traverse gotjawal in the spirit of 'moving meditation' -- with the greatest, and most peaceful, care and respect. This very special forest just may reward you for your kindness: with sighting of a doe staring quietly at you, a cloud of butterflies or fireflies swirling about you as if by magic, or -- for the brave -- a small (non-poisonous) snake slithering quietly out of your way. On the other hand, if it's a chatty romp in the woods with friends or family that you prefer, one that can include camping, picnic, ballgames, and "oreum" (volcanic cone) climbing, "recreational forests" provide all this and more. 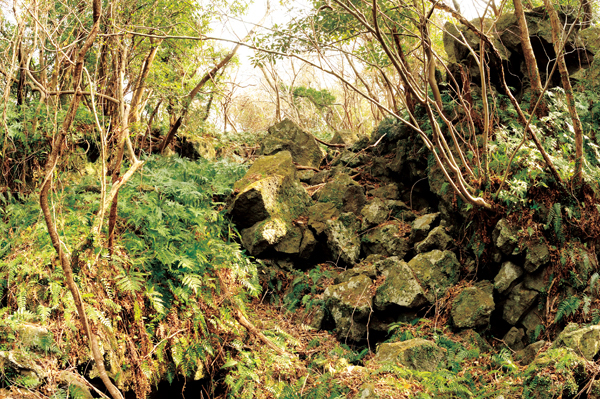 Each of Jeju's many recrea-tional forests, a combination of natural and planned woodland, has its own character. Bulgeun Oreum Recreational Forest, for example, better known by the name of its primary path, Saryeoni Forest Walk, has a wide scoria-lined walkway, cedar maze, picnic tables and three oreum for climbing. It is currently considered the most popular of all, for its reputed "healing" properties. Jeolmul, on the other hand, provides ballfields and can sound more like a public park in its main area near the gate; however, it includes many kilometers of hiking trails and several oreums, and is one of Jeju's largest. Gyorae has a variety of human-made structures, such as straw-roofed houses, and is used for educational purposes. Nearby Jeju Stone Culture Park, considered part of Gyorae though under separate management and with its own entrance, is dedicated to Jeju's traditional use of stone; it includes galleries and a concert hall as well as a folk village, in addition to its wooded paths and multiple stone structures. Seogwipo Natural Recreation Forest, meanwhile, found high on Mt. Hallasan, can be traversed by car, as it includes narrow roads alongside its hiking paths. It is primarily used for camping and is especially family-oriented. Other forests include Halla Eco-forest, and Halla Mountain National Preserve with its 'dulle-gil' or trail system surrounding the mountain at mid-level (not yet completed, but affording many kilometers of trail nonetheless). Naturally, the various hiking trails going up Mount Halla are at times deeply wooded, none more than Gwaneumsa Trail, named after the historically significant Buddhist temple nearby and sought after in autumn for its stunning foliage. Most oreums are also wooded, so one can walk in forests on almost any of the appro-ximately 150 cones that are open to the public. Even the deeply traditional sites of Samseonghyeol in Jeju City and Honinji to the east in Gujwa-eup, areas that collectively symbolize the mythical origins of the three indigenous Jeju clans, contain small but picturesque forests in which one can stroll. On this island of stone, trees have also always maintained a great importance. Each village typically contains a central tree under which villagers gather to beat the heat and exchange the day's news; even some major roads have been built to circumvent a particularly large tree, and there are a number of ancient trees on the island, often centuries old, which have been protected. Additionally, each traditional shamanist shrine, an outdoor holy place of worship for the indigenous religion of this island, is centered around a sacred tree that provides a conduit between temporal and ethereal planes, along which the gods travel. Today we know that the trees provide oxygen for which they require our carbon dioxide in return, creating a vital symbiotic relationship between species. Of course, they also provide a home for countless creatures. And in the seemingly relentless summer sun, the respite afforded by their shade is a welcome relief. Despite Jeju's increasing development, one can still find plenty of places to get "lost" in the woods -- and find tranquility. June to mid-July. The glow-in-the-dark yellowish green lights made by fireflies give a magnificent night view, causing one to concentrate on the quiet scene. The habitats of fireflies are well known as clean and uncontaminated due to their needs. 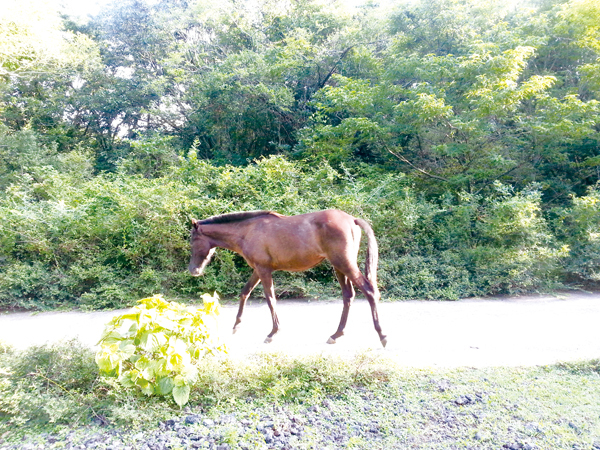 On the other hand, in daytime, horses are found around the gotjawal trails. The local residents in Cheongsu region ask visitors to respect this and step aside when the horses stroll along the paths. Like other gotjawal around Jeju Island, Seogwang is located where the northern and southern tree lines meet and mingle. Thus, the vegetation is varied and is comprises plants grown in temperate forest such as snowbell and linden to those grown in tropical rainforest such as ferns. 30 minutes of easy walking while viewing twigs and ferns in every direction is very pleasant and refreshing. There are also some living inhabitants such as snails and snakes (watch out! ), and one dark brown horse which strolls the path while enjoying the grass and people-watching. From Jeju Intercity Bus Terminal ->#780 ->takes 70 mins ->get off at Sumbinari bus stop -> walk a further 2 k.m. past World Automobile Jeju Museum. From Seogwipo Intercity Bus Terminal ->#780 ->takes 80 mins ->get off at Sumbinari bus stop ->walk a further 2 k.m. past World Automobile Jeju Museum. Joining the path at the Dongbaek-ro entrance as it dissects the forest, one may hear the screeching cicadas reach a crescendo and dominate the atmosphere. The woodland certainly has an enthralling effect. Rather than an oreum which might stun visitors with its majesty, or a stretch of coast with contemplative crashing surf, gotjawal entombs the visitor on a slow ramble as each crunching step achieves an hypnotic rhythm. Dongbaekdongsan is its crowning jewel. It is one of 18 Ramsar Wetland Sites nationally, four of which are on Jeju Island. Most gotjawal areas are without groundwater, yet Dongbaekdongsan is a wetland fed from an underground reservoir, providing breeding ground for rare bird and reptile species. 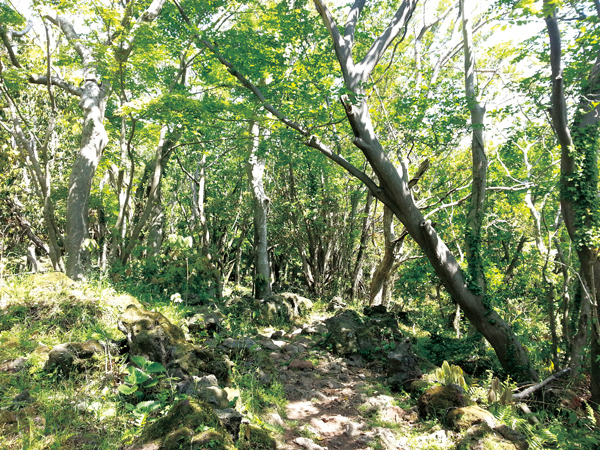 From Gueok Village to Mureung, Shinpyeong, and Jeoji villages, there is a large gotjawal forest area along the Jeju Olle walking trail courses 14-1. Among these areas, the award-winning gotjawal forest trails in Mureung (2008 Beautiful Forest National Competition) were chosen as one of the most beautiful forest trails in Korea where visitors can enjoy many different kinds of plants and trees while walking. Even Chusa Kim Jeong-hee, a great scholar during Joseon Dynasty, said that he could see amaranthine trees in winter and lovely features of autumnal trees here in this gotjawal. He enjoyed the exotic view during his life in exile on Jeju. Cherished by local residents in Daejeong-eup and Hwasun-ri, this gotjawal boasts a beautiful and peaceful view of a fluent curve covered with light green grass with a backdrop of clear blue sky. Added to that are cattle grazing alongside bushes, an unusual scene in modern Korea. This open field view makes Hwasun Gotjawal different from any other around the island, typically covered with a thick layer of trees that makes it dark even in daytime. It offers a pleasant walk, mostly flatland. -> Shin Jeju ->Jeongsil ->516-ro (Road #1131) -> Bijarim-ro (#1112) -> turn left at the intersection of Mini-mini Land (#1118) and continue straight for 1 k.m. Facilities: Cabins, outdoor seminar hall, paddling area, hiking trails, ecotourism trail, and more. There is also a parking fee from 1,000 won to 3,000 won depending on the size of car. ->Seogwipo -> 5.16-ro (#1131) ->Seoseong-ro ->turn left at the intersection with Namjo-ro (#1118) and go straight for 7 km.